My oh, my...this one really has my typing fingers a flyin' and my knitting fingers itchy to cast on again. (Really, one can't ever have too many projects-in-progress now can we?) I've been cruising around the Internet looking at this, searching for that...and this group, well, they aren't just up to date, they are updating as I read their page!! Wool Aid is their name. So far this year, this group of almost 1000 knitters has produced more than 2000 woolen pieces hats, mittens, scarves and sweaters to be donated to needy children living in cold climates around the globe. They aim to create and donate more than 3000 pieces in 2012! 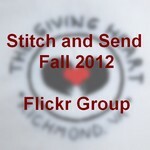 Their website has great guidelines, easy patterns, and an address where to send knitted and monetary donations. 12 in 2012 is their current campaign with a 12/31/12 deadline (visit the site for more) and the organization accepts donations year round to help keep children warm. Very cool, very inspiring, and all I can say is, wow...check this group out here. And for their very active Ravelry page, click here.